Founded over 77 years ago, Plan International is one of the oldest and largest children's development organizations in the world. We work in 51 developing countries across Africa, Asia and the Americas to promote child rights and lift millions of children out of poverty. We take active measures in recruitment and employment practices to ensure children are protected. 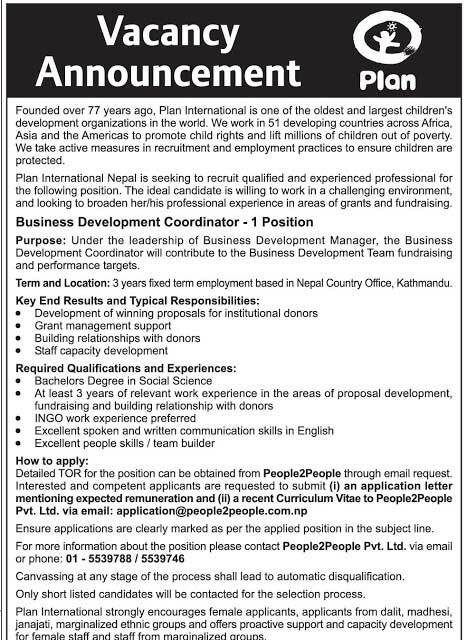 Plan International Nepal is seeking to recruit qualified and experienced professional for the following position. The ideal candidate is willing to work in a challenging environment, and looking to broaden her/his professional experience in areas of grants and fundraising. Purpose: Under the leadership of Business Development Manager, the Business Development Coordinator will contribute to the Business Development Team fundraising and performance targets. Term and Location: 3 years fixed term employment based in Nepal Country Office, Kathmandu.